My mission, if I chose to accept it, was to ride a motorcycle at high speeds down an airstrip and onto a C-130 while its occupants shoot at me. Once aboard the aircraft it would take off to an altitude of several thousand feet. I would get into a gunfight with the occupants, plant a bomb and then jump out with my trusty parachute to safety. As amazing a feat as completing this mission seemed, what actually happened was far more awesome than I could have imagined. See, it took me two tries to hit the cargo ramp of the C-130 just right with the motorcycle without running into one of the barrels my enemies were tossing at me from the open cargo ramp, leading me to believe that I had a boss fight with Donkey Kong coming up. That wasn’t true, but one can dream. Once aboard the aircraft, the gunfight with a few government agents (or whoever they were) was easy enough. All I had to do then was plant a bomb (Press “X” here) and jump out with my parachute. All was going well as my camo-and-cowboy-boots version of Carl Johnson leapt from the plane and immediately popped his chute. About this time, I noticed an altimeter on the right side of the screen with an indicator at the 500 feet mark telling me that I should wait until then to pop my chute. Another indicator on the altimeter marked my current altitude…at a few thousand feet. I slowly descended upon San Andreas, having no idea where I would land. I got up, made a drink, came back, texted my brother, played with my floating character for a while, and I still was only halfway down from where I had jumped out of the plane. After an agonizing few minutes of falling, finally I touched down in a military compound of sorts. Camouflaged men swarmed to my position and after a mere few seconds of gunplay my health bar was almost completely diminished. I had to do something to keep from dying, so I ran into a nearby hangar for a moment’s reprieve and found my saving grace: A friggin’ tank. I imagined the military force outside, guns ready, their leader saying something like “We got ‘im on the run, boys!”. I also imagined the looks on their faces when the hangar door opened and I came barreling out in their rolling fortress of doom and terror to exact my retribution for the hostility shown to me upon my arrival. After I was done running over and/or blowing up everyone, I figured it was time to go back to the airfield I owned and park my new toy in the hangar for safekeeping. After about a 5 minute drive, I was there. I had made it! I got out of the tank feeling pride, but not from completing the assigned mission. No, I felt this pride from getting that kind of non-scripted experience from a video game and surviving it. Could another game ever give me that experience? The first time I ever wandered into Old Olney in the Capital Wasteland was a memory I will hold forever. I got maybe a hundred yards into the city before I wondered what the deal was because there were no NPC’s or enemies about. It turns out I had walked through a Deathclaw’s patrol route at just the right time so he didn’t see me! Before I knew it, I was in a nightmare world of Deathclaw doom where running FROM one meant running INTO another. The place was crawling with the things, and having never actually run into one of these creatures before it was one of the most frightening experiences I ever had on a video game. I even tried to escape through a sewer tunnel, only to find out how bad of a decision it was to find myself in an enclosed space with a Deathclaw instead of somewhere out in the open. That was where I died, but I wasn’t the least bit upset about it because of how insanely cool it was to have such an unscripted yet visceral experience from a game. The Grand Theft Auto series wasn’t the first to have an open world the player could explore at his/her will, but they did do a lot to progress the “Sandbox” type of game. The formula they used was (in my opinion) perfected in GTA: San Andreas, a game marred by criticism for its mature content. Like I said, though, they weren’t the first to have an open world. The Fallout series had been sporting an open world since 1997, though not from the perspective we have become accustomed to in Fallout 3. One might think that the most appealing nature of having such a broad expanse of territory to explore is that it gives the overall game experience a level of depth otherwise unobtainable, and that is quite true. Riding around on a horse in the 1998 hit The Legend of Zelda: Ocarina of Time was really cool for its time, but 14 years later The Elder Scrolls is fully capitalizing on that experience by delivering randomized events for the wandering adventurer. A dragon, an assassin, an orc who wants to die, guards transporting prisoners that are either political allies or enemies of the player, all sorts of things can happen when traversing between towns or missions. 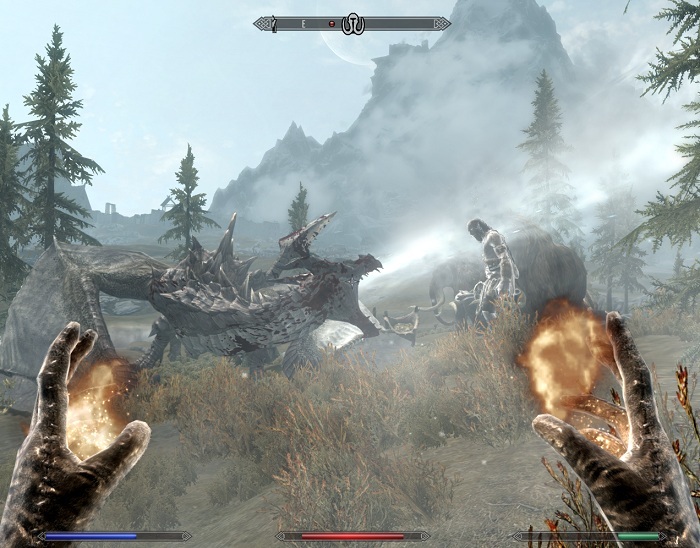 The first time I came upon a giant and a dragon fighting each other I sat and watched. The dragon’s appearance was meant to be a challenge for my character, but the giant had been scripted to not take kindly to any trespasser. The dragon won, and when I went into the fight I had to take on the dragon AND a few territorial mammoths the giant had left unguarded. In the Spider-Man 2 movie game, the open world provided a most awesome setting for a web-swinging simulator. I’m sure citizens of New York can attest to the geographical exactness of the game, though for the record I am not jealous about the fact that nobody ever made an open-world superhero game about Fayetteville, NC. In the game, however, most everything was a triggered event. There weren’t any opportunities for something actually spectacular to happen that would stick in your memory for years to come. I’m not so naïve’ to think that Skyrim or GTA has a truly organic world where everything is happenstance, but it’s a lot easier to believe when events take place that the player cannot easily recreate. Those games are just lines of code like any other, but the games were coded so that the possibilities of abnormal occurrences are more frequent by not perfectly timing and scripting every little step in the adventurer’s path. This article is a salute to the open world game, which has no doubt in its many different forms provided unique and unforgettable experiences to the player who is not intimidated by its enormity. If walking across a map for 30 minutes and not reaching the other side doesn’t sound like a fun time to you, go play Dr. Mario. I can’t wait to play games like Dishonored, which provides a more civilized open-world setting than what I am used to but no doubt will have me pushing the boundaries of its “choose your own adventure” style of gameplay. For those about to walk…we salute you.